You are much welcome 🙂 Yes we were indeed created for praise the Lord. Amen. Many blessings to you. Another wonderful upbeat inspirational post. Thank you. I feed my birds to reward their singing and to help keep the mosquitoes away. Same as our singing out praise to the Lord helps to reward our spirit as well as warn evil away. .
You are much welcome. Thank you for reading and info about birds chirp could the mosquitoes away. I didn’t know it before. Once again thank you very much. Blessings. The psalms are wonderful songs to the Lord. It’s funny that I was think inking of Psalm 98:1 this morning too. Every morning is new time to praise Him! What a timely we have same idea at the same time. I will link yours to mine later. Yes. Thank you for reading my post, sis. Blessings. Dear sister in Christ, Natalie. Thank you very much. Amen! Let’s praise The Lord 🙂 Blessings. Thank you for these good reminders about praising the Lord. Nothing can fill your heart with joy like singing praises to Him no matter what is going on in your life! He is amazing that way! Dear sister in Christ, Betty. You are much welcome 🙂 yes you are so true. Nothing can fill our heart with joy like praise Him. Thank you so much for lovely comment. Many blessings to you. We are surely created to praise Him Karina! As I read your post I see how I have not taken praise seriously anymore. I praise Him here and there but it’s not a lifestyle any more!!! I feel sad how far I have fallen but this is another chance to make it right! Thank you for this important post Karina! Thanks Karina. I will pray indeed….May you have a great week! I don’t have a syrinx, but I have breath, and I’m praising him! Thanks, Karina! Thank you very much for reading 🙂 we don’t have Syrinx yet we have Larynx. 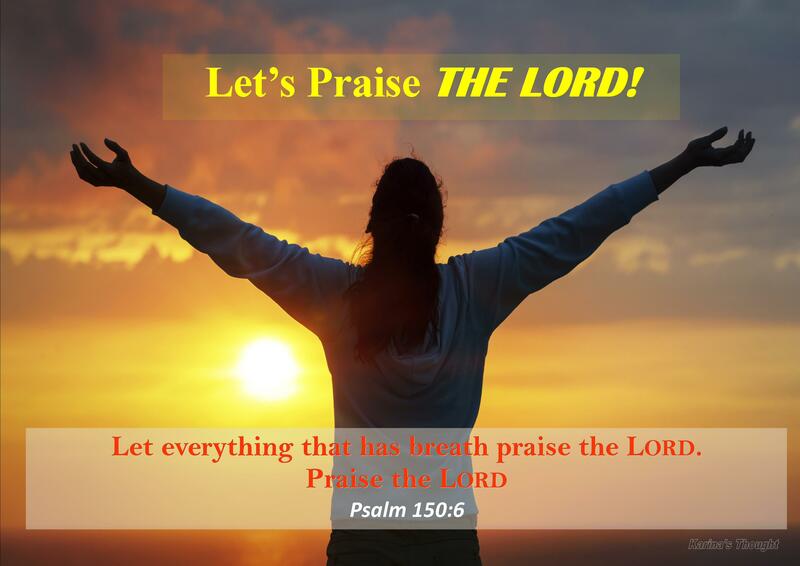 Whatever we have as long we have breath, let’s praise to The Lord. Blessings. Dear sister in Christ, Diane. Thank you so much 🙂 I really love your comment. Yes it was true. Birds never grumbling or complaints, instead they sing a beautiful song every morning. Many love and blessings to you. Thank you for your like of my post, “Life From Life.” You are very kind. You are much welcome 🙂 Blessings. Amen! A beautiful post, Karina. Yes, the songs we have in our hearts may not always sound good to our ears, but the tune from a sincerely loving hearts in praise is a “sweet savor” to the Lord! A wonderful post!! Dear brother in Christ, Steve. You are much welcome 🙂 Thank you for the lovely comment. Blessings. God does wonders for people who praise him with all their hearts and soul. Amen! Thank you very much for reading my post. Blessings to you. Thanks, Karina – and thanks, also, for liking my” Search The Scriptures” notes on the four Gospels. God bless you, and make you a blessing to many. Prayer’s a great way to begin the day. Work’s for me. Peace. Yes. So true praying and praising to the Lord is very best way to begin the day. Works for me too 🙂 Blessings to you. What a timely. I just thinking to write about the power behind praise and worship. And one of the Bible reference is from 2 Chronicles 20 🙂 Thank you for the thoughtful comment, sis. Many blessings and have a great weekend. Dear sister in Christ, Sheryl. Amen! God is enthroned on our praise. You are much welcome 🙂 Thank you too for reading and the wonderful comment. Many love and blessings. Wise and beautiful, Karina. Thank you! You are much welcome, sis. Thank you for reading 🙂 have a blessed day. I was singing this singing this song this morning during Quiet Time. :) Have a good night Karina.